Tampa, Florida – The millions of people who spend hours every day on a cell phone, may have a new excuse for yakking. A surprising new study in mice provides the first evidence that long-term exposure to electromagnetic waves associated with cell phone use may actually protect against, and even reverse, Alzheimer’s disease. The study, led by University of South Florida researchers at the Florida Alzheimer’s Disease Research Center (ADRC), was published today in the Journal of Alzheimer’s Disease. The researchers showed that exposing old Alzheimer’s mice to electromagnetic waves generated by cell phones erased brain deposits of the harmful protein beta-amyloid, in addition to preventing the protein’s build-up in younger Alzheimer’s mice. The sticky brain plaques formed by the abnormal accumulation of beta amyloid are a hallmark of Alzheimer’s disease. Most treatments against Alzheimer’s try to target beta-amyloid. The highly-controlled study allowed researchers to isolate the effects of cell phone exposure on memory from other lifestyle factors such as diet and exercise. It involved 96 mice, most of which were genetically altered to develop beta-amyloid plaques and memory problems mimicking Alzheimer’s disease as they aged. Some mice were non-demented, without any genetic predisposition for Alzheimer’s, so researchers could test the effects of electromagnetic waves on normal memory as well. Both the Alzheimer’s and normal mice were exposed to the electromagnetic field generated by standard cell phone use for two 1-hour periods each day for seven to nine months. 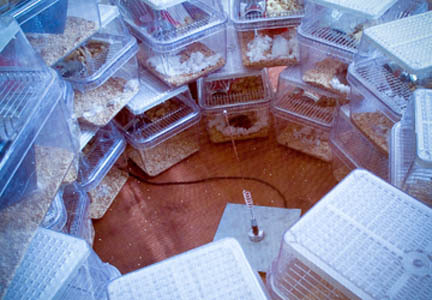 The mice didn’t wear tiny headsets or have scientists holding cell phones up to their ears; instead, their cages were arranged around a centrally-located antenna generating the cell phone signal. Each animal was housed the same distance from the antenna and exposed to electromagnetic waves typically emitted by a cell phone pressed up against a human head. Caption: Mice were exposed to cell phone signals from a centrally-located antenna. If cell phone exposure was started when the genetically-programmed mice were young adults -- before signs of memory impairment were apparent -- their cognitive ability was protected. In fact, the Alzheimer’s mice performed as well on tests measuring memory and thinking skills as aged mice without dementia. If older Alzheimer’s mice already exhibiting memory problems were exposed to the electromagnetic waves, their memory impairment disappeared. Months of cell phone exposure even boosted the memories of normal mice to above-normal levels. The memory benefits of cell phone exposure took months to show up, suggesting that a similar effect in humans would take years if cell phone-level electromagnetic exposure was provided. Based on their promising and unexpected findings in mice, the researchers concluded that electromagnetic field exposure could be an effective, non-invasive and drug-free way to prevent and treat Alzheimer’s disease in humans. They are currently evaluating whether different sets of electromagnetic frequencies and strengths will produce more rapid and even greater cognitive benefits than those found in their current study. The memory test used to evaluate the effects of cell phone exposure in mice was closely designed from a sensitive test used to determine if Alzheimer’s disease, or its very early signs (mild cognitive impairment), are present in humans. “Since we selected electromagnetic parameters that were identical to human cell phone use and tested mice in a task closely analogous to a human memory test, we believe our findings could have considerable relevance to humans,” Arendash said. The researchers found a slight increase in brain temperature during the two one-hour periods when mice were exposed to electromagnetic waves each day. This increase in brain temperature was seen only in the Alzheimer’s mice, and only after months of exposure. The researchers suggest the increase in brain temperature helped the Alzheimer’s brain to remove newly-formed beta-amyloid by causing brain cells to release it. Previous human studies of electromagnetic waves from cell phones involved only brief exposures given to normal humans. While some studies reported small improvements in attention or memory (not enough to impact daily life), others reported no memory effects from short-term exposure. The new study by Arendash, Cao, and their colleagues is the first to investigate the effects of long-term electromagnetic exposure over many months on memory function in either humans or animals. The findings indicate that “long-term” exposure to cell phone level electromagnetic waves is needed to observe enhanced memory in normal or memory-impaired mice. The USF researchers began investigating the effects of cell phone use on Alzheimer’s disease several years ago, after several observational studies in humans linked a possible increased risk of Alzheimer’s with “low-frequency” electromagnetic exposure -- like the energy waves generated by power and telephone lines. However, cell phones emit “high-frequency” electromagnetic waves, which are very different because they can have beneficial effects on brain cell function, such as increasing brain cell activity, Arendash said. There has been recent controversy about whether electromagnetic waves from cell phones cause brain cancer. Some researchers argue that the risk of glioma (40 percent of all brain tumors) doubles after 10 or more years of cell phone use. However, others argue that since the overall lifetime risk of developing a brain tumor of any type is less than 1 percent, any doubling of this risk would still be very low. Groups such as the World Health Organization, the American Cancer Society, and the National Institutes of Health, have all concluded that scientific evidence to date does not support any adverse health effects associated with the use of cell phones. Consistent with the view of these organizations, the researchers found no autopsy evidence of abnormal growth in brains of the Alzheimer’s mice following many months of exposure to cell phone-level electromagnetic waves. They also found all major peripheral organs, such as the liver and lungs, to be normal. The research was conducted by an interdisciplinary group of neuroscientists, electrical engineers, and neurologists from universities in Japan and China as well as from the Florida ADRC at the University of South Florida. The studies were supported by funds from the Florida ADRC, a statewide project sponsored by the National Institute on Aging. Note to Editors: Copy of journal article available upon request. Electromagnetic Field Treatment Protects Against and Reverses Cognitive Impairment in Alzheimer’s Disease Mice. Gary W. Arendash, Juan Sanchez-Ramos, Takashi Mori, Malgorzata Mamcarz, Xiaoyang Lin, Melissa Runfeldt, Li Want, Guixin Zhang, Vasyl Sava, Juan Tan and Chuanhai Cao. Journal of Alzheimer’s Disease, Volume 19:1 (January 2010). USF Health (http://www.health.usf.edu) is dedicated to creating a model of health care based on understanding the full spectrum of health. It includes the University of South Florida’s colleges of medicine, nursing, and public health; the schools of biomedical sciences as well as physical therapy & rehabilitation sciences; and the USF Physicians Group. With more than $380.4 million in research grants and contracts last year, the University of South Florida is one of the nation’s top 63 public research universities and one of only 25 public research universities nationwide with very high research activity that is designated as community-engaged by the Carnegie Foundation for the Advancement of Teaching. The Journal of Alzheimer's Disease (http://www.j-alz.com) is an international multidisciplinary journal to facilitate progress in understanding the etiology, pathogenesis, epidemiology, genetics, behavior, treatment and psychology of Alzheimer's disease. The journal publishes research reports, reviews, short communications, book reviews, and letters-to-the-editor. Groundbreaking research that has appeared in the journal includes novel therapeutic targets, mechanisms of disease and clinical trial outcomes. The Journal of Alzheimer's Disease has an Impact Factor of 5.101 according to Thomson Reuters' 2008 Journal Citation Reports. The Journal is published by IOS Press (http://www.iospress.nl).